Work on a pair of double point needles or on a circular needle. Cast on loosely an odd number of sts with color A.
Set-up row: Using color B, k1, * yf sl1yo, k1; rep from * to end. Do not turn, slide sts back to opposite end of needle. Row 1: Using color A, sl 1, * brp1, sl1yof; rep from * to last 2 sts, brp1, sl 1. Turn work. Row 2: Using color B, p1, * sl1yof, brp1; rep from * to last 2 sts, sl1yo, p1. Do not turn, slide sts back to opposite end of needle. 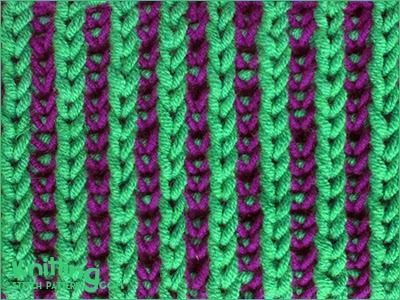 Row 3: Using color A, sl1, * brk1, yf sl1yo; rep from * to last 2 sts, brk 1, sl1. Turn work. Row 4: Using color B, k1, * yf sl1yo, brk1; rep from * to last 2 sts, sl1yo, k1. Do not turn, slide sts back to opposite end of needle. With MC, cast on loosely an even number of stitches. Place a marker for the beginning of the round. Set up row: With CC, * sl1yof, p1; rep from * to end of round. Repeat Rounds 1 - 2. Sl1yof (slip 1, yarnover, yarn to front): with working yarn in front, slip the next stitch purlwise, then bring the yarn over the needle (and over the slipped stitch) then back to the front and under the needle in position to purl the following stitch. Yf sl1yo (yarn forward, slip 1 purlwise, yarnover): bring the working yarn under the needle to the front of the work, slip the next stitch purlwise, then bring the yarn over the needle (and over the slipped stitch) to the back in position to work the following stitch. Brk (brioche knit - also known as a bark): knit the stitch (which was slipped in the row before) together with its yarnover. Brp (brioche purl - also known as a burp): purl the stitch (which was slipped in the row before) together with its yarn over.